My first visit to the traditional site of the baptism of Jesus and the work of John the Baptist was in 1967 (see photo of the group here). After the Six Days War in June, 1967, it was not possible to visit the site until about 2011. My next visit to the site in Israel was in May, 2011. In the meanwhile I had already taken three groups to Jordan so we could visit the site, traditionally known there as Bethany Beyond the Jordan. In May, 2011, we had to stop at this gate and wait for someone from the military to come and open the gate for the bus to enter. Photo by Ferrell Jenkins. The expression “beyond the Jordan” in John 1:28 distinguishes this Bethany from the Bethany on the east slopes of the Mount of Olives, the home of Mary, Martha and Lazarus (cf. John 11:1). Jesus was with John “beyond the Jordan” (3:26), and went away to this region prior to his final work in Judea (10:40). The Greek word for beyond is peran, from which comes the geographical term Perea. Perea was on the east side of the Jordan River. The NKJV follows late manuscripts in the reading Bethabara. There are textual variants on this point, but the earliest and best reading is Bethany in John 1:28. 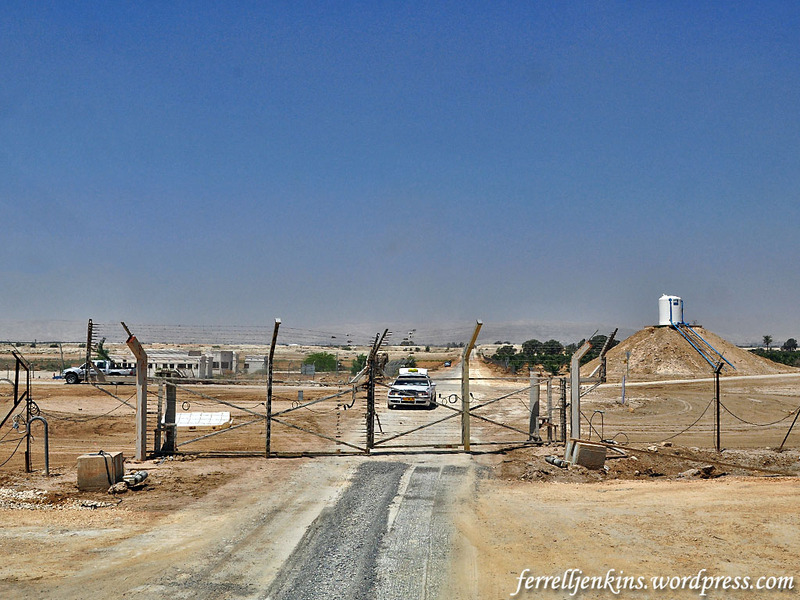 One reason for the long delay in opening the site in Israel was that it was in a military area. Much of the area had been filled with landmines and anti-tank mines after the 1967 war to prevent Jordanian tanks from crossing it. Seven churches had been constructed in the area during the British Mandate period in the 1930s. A drone video included in the The Times of Israel article (link below) shows ruins of the Franciscan Compound, the Ethiopian Church, the Syrian Church, and the Romanian Church. Greek Orthodox pilgrims were already allowed to visit the baptism site to celebrate Epiphany. Now, the HALO Trust fund has begun raising money to rid the area of mines. The TOI article says the Israel Defense Ministry contributed funds as well. I call the Jordan a shy river that seldom shows itself. One can drive through the Jordan Valley from Tiberias to the Dead Sea and rarely get a glimpse of this famous River. That is because of the depth of the Jordan Valley and the growth along the banks of the River. The River no longer floods the valley as it once did, and it is no longer as wide as it once was. This is because the water is now being used by both Israel and Jordan for agriculture and to provide drinking water for the growing population. A view of the Jordan River to the north at Qasr al-Yahud. At this point the river is about 405 meters (1330 feet) below sea level. Photo by Ferrell Jenkins. As we leave the River we stop to look back across the Ghor (depression) to the Zor (the thicket, shown as the green line) where the River flows. This is the view slightly north of the baptism site. This photo shows the west side of the Jordan River in the foreground, the Ghor (depression) of the Jordan River, the Zor (thicket), the land of Perea on the east side of the Jordan, and the mountains of Transjordan in the haze. Photo by Ferrell Jenkins. Barb wire and signs warn the adventurous from wandering off the dirt road leading back to Highway 90. This is one of the signs warning of the landmines. We also see these in certain areas of the Golan Heights. Photo by Ferrell Jenkins. Here are links to two recent articles from Israeli papers that I have enjoyed. “Christian Pilgrims From Across the World Come to Israel to Visit This Site. There’s Just one Problem: It’s Sitting in a Minefield” (Haaretz). 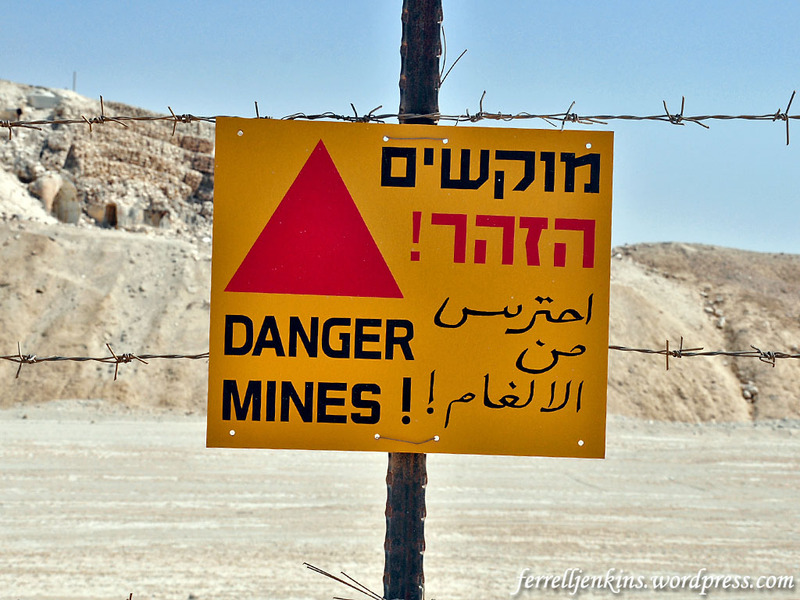 “Israel will soon clear 4,000 landmines at Qasr al-Yahud baptism site” (Times of Israel). 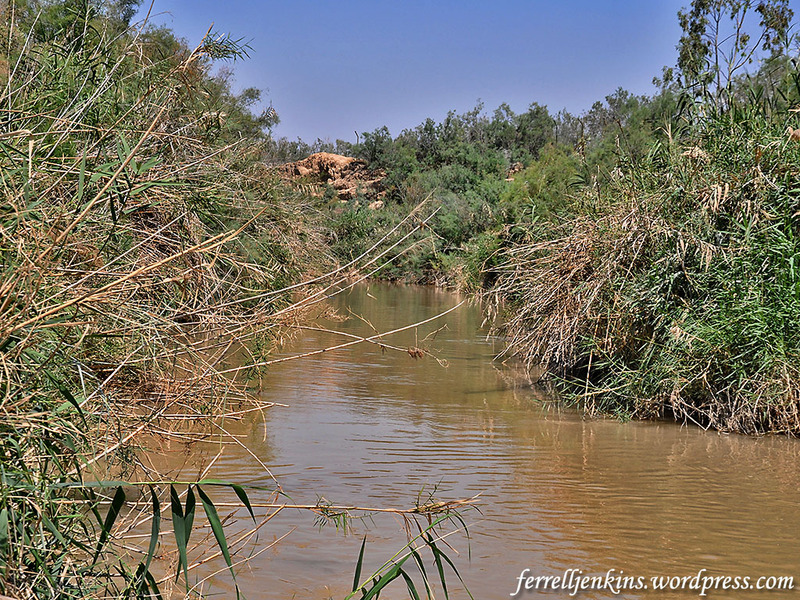 In spite of many environmental warnings about the impurity of the water in the Jordan River at this site many groups continue to baptize there. 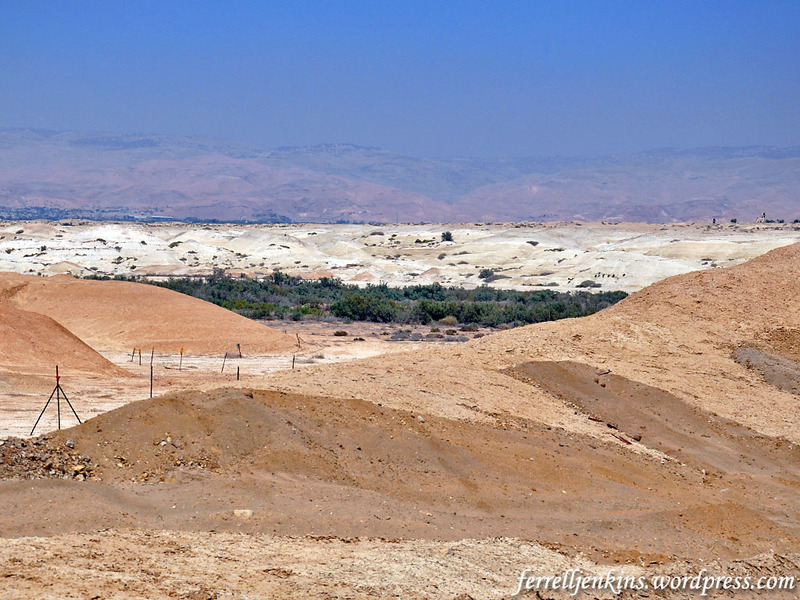 This entry was posted in Bible Places, Bible Study, Culture, Israel, Jordan, New Testament, Photography, Travel. Bookmark the permalink. I thought about including a comment about the location in the West Bank, but overlooked it. Glad you pointed this out. As usual, I’m tilting at windmills– but I consider myself in good company in the pursuit. I can’t help pointing out that the site in question here, Qasr al-Yahud, is not “in Israel”, as stated twice in the post. It lies, since 1967, in the Israeli-occupied West Bank. I know, it’s easy to fudge on this point, but every time we do, a rational solution to the Israeli-Palestinian conflict slips that much further away. Why does the “occupied” status of the West Bank deserve to stay on our radar? Simply put, in a (supposedly) civilized world, (presumably) governed by international law, states cannot be allowed to gain sovereign territory by force of arms. The principle is that basic, and should not be hard for decent people everywhere to embrace.